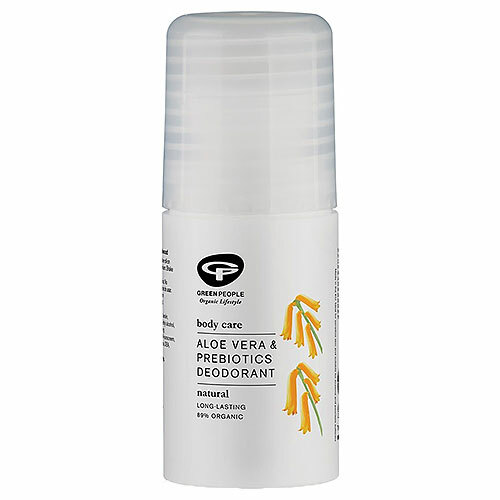 Green People Aloe Vera and Prebiotics Roll On Deodorant is a refreshing, natural deodorant with a gentle scent of Aloe Vera, Sandalwood and Chamomile. Aqua, Ammonium Alum, Olea Europaea Fruit Oil*, Helianthus Annuus Seed Oil*, Zinc Ricinoleate, Cetearyl Glucoside, Cetearyl Alcohol, Butyrospermum Parkii Butter*^, Glyceryl Stearate, Levulinic Acid, Alpha-Glucan Oligosaccharide, Aloe Barbadensis Leaf Juice Powder*, Rosmarinus Officinalis Leaf Extract*, Aroma [Santalum Austrocaledonicum Oil*, Anthemis Nobilis Flower Oil*^], Cetearyl Olivate, Sorbitan Olivate, Sclerotium Gum, Xanthan Gum, Sodium Stearoyl Glutamate, Sodium Lauryl Glucose Carboxylate, Lauryl Glucoside, Potassium Sorbate. Roll onto clean, dry armpits. Below are reviews of Green People Aloe Vera Roll On Deodorant - 75ml by bodykind customers. If you have tried this product we'd love to hear what you think so please leave a review. 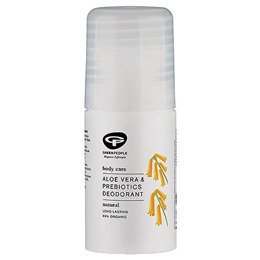 Been looking for a natural deodorant for a while. I thought I'd buy this as it said it let your body sweat as it's naturally supposed to, but I wanted a nice smelling natural product to put on whenever I wanted to freshen up. I find this roll on to be great, and I'll buy again.